A bright, colourful and adorable decor done with premium quality metallic, latex, and foil balloons! "Unicorns are dreamy creatures- straight out of fairytales! Gift your loved one the feeling of being in a fairytale by getting this amazing unicorn decoration done for them at their home! 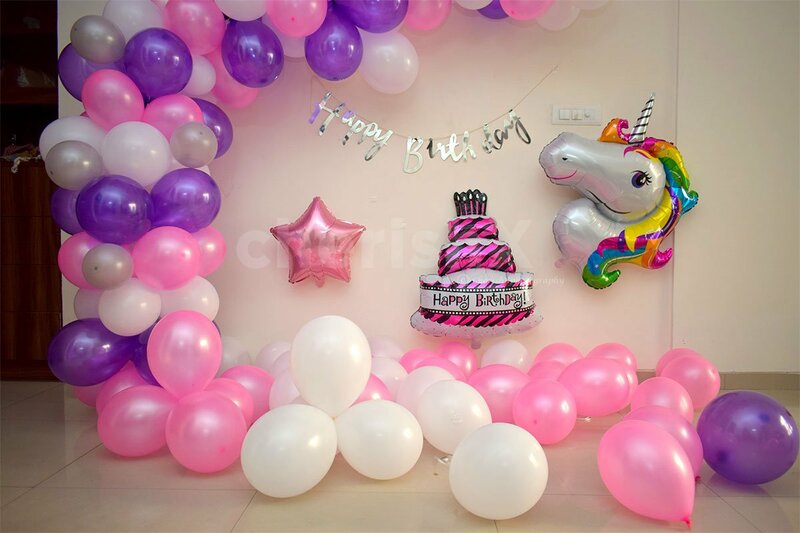 We bring to you an artistic decoration crafted with 40 pink, white, and purple latex balloons attached to the ceiling with soft removable tape and ribbons dsngling from it, Along with an arc made of 80 latex balloons of the same colours as well as 10 metallic silver balloons, 1 happy birthday cake foil balloon, 1 happy birthday silver bunting, 1 big unicorn foil balloon, 2 silver star-shaped foil balloons, and last but not the least- 15 white and 15 pink balloons strewn sweetly on the floor. 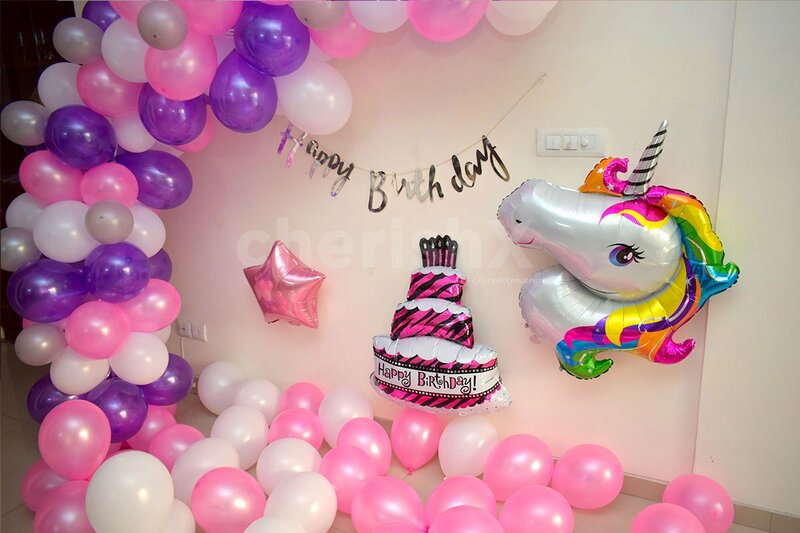 This unique and dreamy decor is perfect for birthdays and other cute occasions. If you want to make your precious one feel loved and important, sweep them off their feet with this sweet surprise. 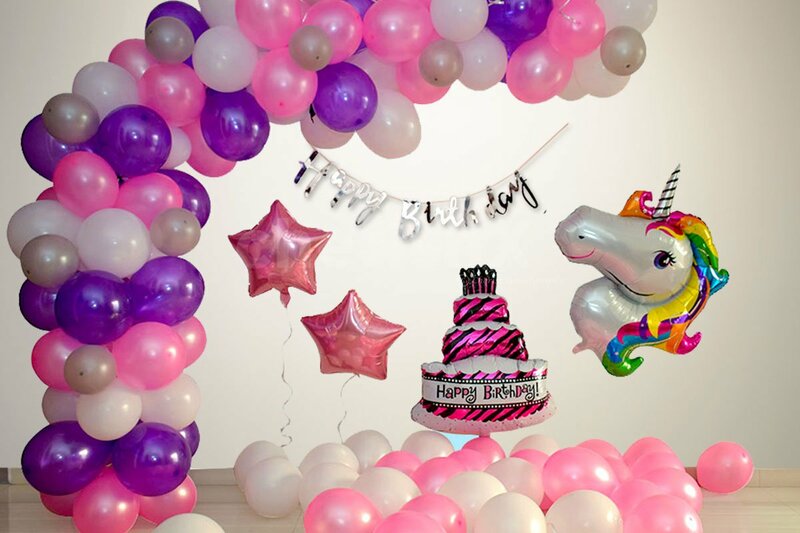 The highlight of this decoration is the rosy pink colour, and the adorable unicorn balloon. 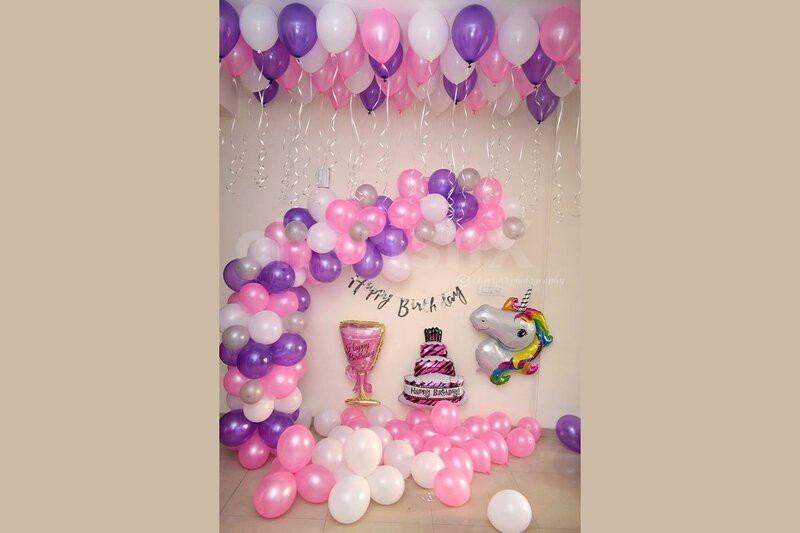 The white, pink, and purple balloons increase and elevate the coziness that this decor exumes. The silver coloured 'happy birthday' bunting adds to the festive fervour and happiness of the occasion. We always say- the bigger the surprise, the better it gets! Sweeten the occasion with a soft and gooey cake. Choose to include your memories in the surprise Add some letter foil balloons and give a love-filled message, or happy birthday foil balloons. 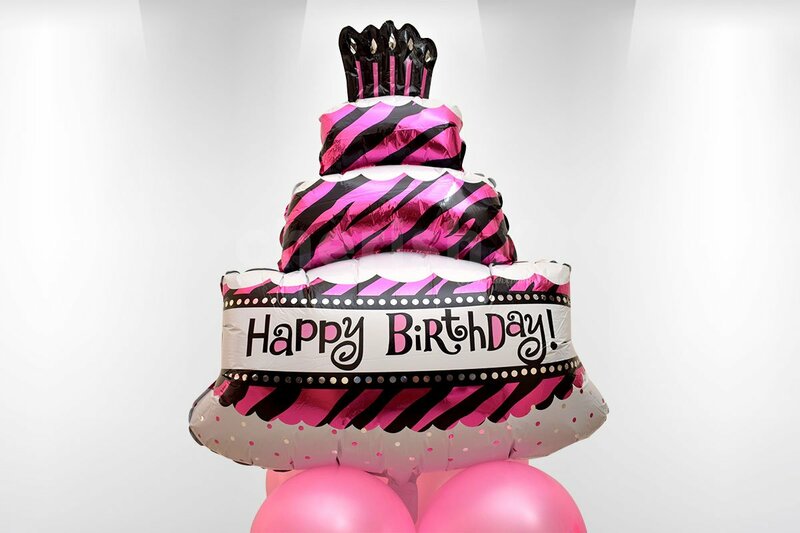 Add 20 LED balloons with 'happy birthday' printed balloons. Make it bigger and add 100 more balloons. 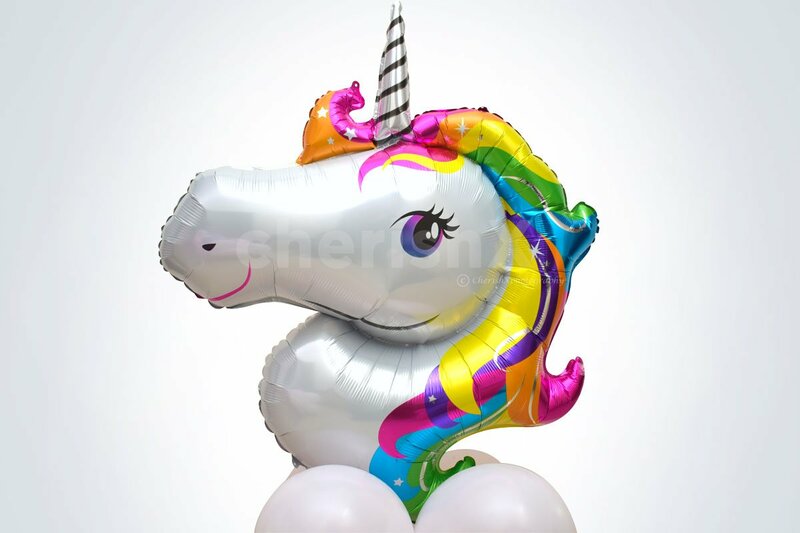 Add 1 more unicorn foil balloon and make it more and more cute! All this and more, in our customisations below! " Add 4 small confetti balloons for your cake.